After months of waiting for LSS to straighten out the mess they made with Juliette’s birth certificate and then finally filing our petition with the court and then the court saying on Wednesday that there were “issues” with our filing that prevented them giving us a hearing date, I arrived to work this morning and got a phone call from the program manager at LSS telling us they were hand-delivering one more item to the clerk of the court that the clerk’s office wanted and that the clerk had penciled us in on the judge’s calendar for a finalization hearing Thursday morning at 9:30. Oh, lord, I can hardly believe it, but I am so very, very happy at this unexpected turn of events. Keeps your fingers (and whatever else is worth it!) crossed that all goes off without a hitch and that we wake up Friday morning to the certain knowledge that she is ours forever! My mom is coming on Wednesday for an extended visit and I’m so looking forward to it. What you see below is what I sometimes jokingly referred to as “the spa” – a bedroom in our basement that has never really been used for much. 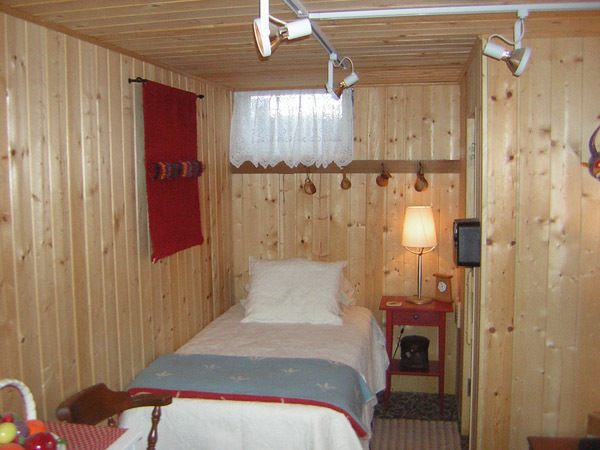 It was outfitted with a real Finnish sauna by the prior owner and the first year we lived here, we used the sauna several times, but no so much since then. So the room slowly involved into a catch-all junk room. But with the former guest room turned into the nursery, we needed a place for mom, who will be here until after the New Year. It all started last week when we picked up the new mattress we bought the week before. We had to haul away the old sofa that was being stored in the room, along with some other stuff, on Saturday, move out one large cabinet that was in the room but wasn’t needed there anymore, etc., etc., etc. Outfitted with all new linens, a new bedside table and chest from Ikea, the sturdy old wingback from the den, and some carefully chosen artwork & gorgeous Finnish textiles that Harald brought back from there, the room evokes what I imagine is a very Scandinavian vibe (and I have it on good authority, too!). We’ve done a ton of other stuff to spruce up the bathroom, improve safety (read: replace old fire detectors with new fire/smoke/C02 detectors), and generally make it the most inviting space we could manage. And if you don’t mind my saying so, I think we succeeded. 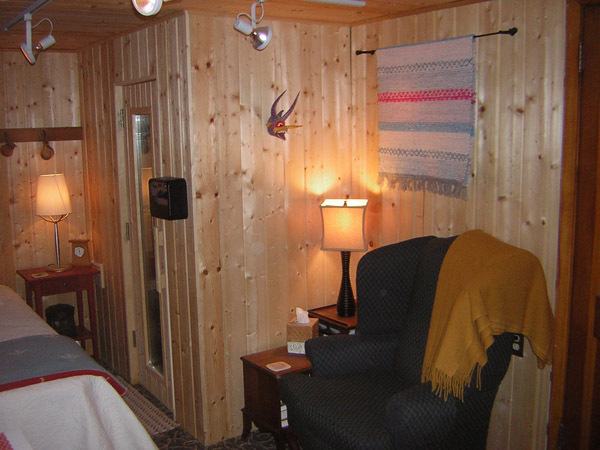 Yes, the sauna will come out one day – we will likely haul it up Lutsen and install it there. But for now, I think this is a pretty cozy looking bedroom for any guest. Her new bed is ready and waiting. A cozy sitting nook for reading or just relaxing (or knitting!). Once you get hooked on satellite radio, it’s hard to go back to broadcast. I’ve gotten spoiled. Last night, on the way to Target, I was listening to Chill on Sirius (channel 35) and found myself loving what I was listening to. Turns out it’s a group called Streetlife Originals. They hail from north east England and you can find out more here. I gotta get that ‘Sidewalk Stories” album, even though it costs a small fortune as an import. The song below is a good example of their style. The song I was listening to last night was The Assassin, Act 1 and appears on the album “Costes La Suite” from Stephane Pompougnac and is described as a “Deep House” style of Electronica. Who knew? In the process of trying to find all this information, I came across the Discogs site, a wealth of information. As it turns out, this particular CD is part of a compilation of lounge music put out by the Hotel Costes in Paris and you can get them all at Amazon. It is the second CD in the series you want for the Streetlife Originals song I was listening to last night.